The voice of Roxas claims to be back in the studio, hinting at a localization for Kingdom Hearts 1.5 HD ReMix. Last fall, Square Enix revealed that it was working on an HD compilation of Kingdom Hearts games, due out for the PS3 in 2013. Thus far, Kingdom Hearts 1.5 HD ReMix is only planned for a Japanese release, but a North American localization may be in the works, if one of the series' recurring voice actors is to be believed. 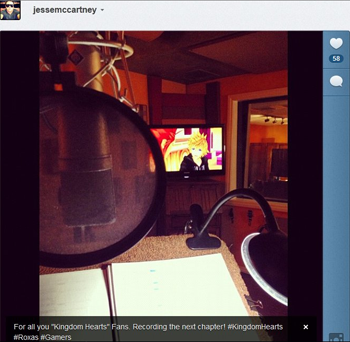 Jesse McCartney, who has voiced Roxas since the character's introduction in Kingdom Hearts II, posted this photo to his Instagram account, along with the caption "For all you 'Kingdom Hearts' Fans. Recording the next chapter! #KingdomHearts #Roxas #Gamers." The Instagram post has since been deleted, and Square Enix hasn't yet commented on whether or not HD ReMix will be released outside of Japan. The compilation includes Kingdom Hearts Final Mix, Kingdom Hearts Re:Chain of Memories, and remastered scenes from Kingdom Hearts: 358/2 Days; though Roxas didn't appear in the first game and was only teased at the very end of Chain of Memories, he was the protagonist of 358/2 Days, which could explain why he has reportedly resumed his voice acting duties. If the HD remake is localized, it will be the first time Kingdom Hearts Final Mix is released outside of Japan. The re-release of the first game featured addition content, like more scenes explaining Riku's journey. Kingdom Hearts 1.5 HD ReMix is due out in Japan this March.